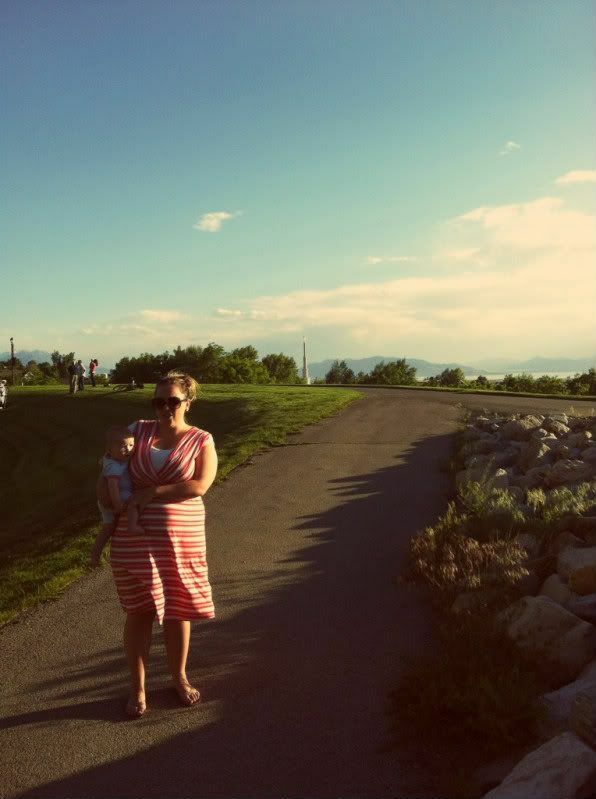 Last evening I took my kids to Rock Canyon park, which is a park in the shape of a bowl. A soup bowl. And around the top of the bowl is a black-topped walking path (some people prefer to run it, moronic people) with views that reach across the valley clear to the shores of Utah Lake. My point was to wear down the troops so I could fling them into bed, lifeless and limp, an hour later avoiding their well-skilled stalling (ONE MORE QUESTION Anson says twenty times). I marched them around that perimeter, noting the jagged mountains to the east, a temple spire to the south and Utah Valley in the round. About half way through the journey Ever stopped at a rock garden and started to climb. "I'm climbing the rocks," she told me. "Holy gravy girl! Who taught you to talk?! You're barely two years old!" A break from writing about me. Yesterday I wrote the next chapter in My Life Story saga and it sat like a pit in my stomach all day. I carved out a few extra hours to work on it, but it just stared at me and I stared back at it. Though my hope was to write my life story without moral--to just write as it were--I get to this part of being nineteen and it's so terribly confusing to me I don't even know what to say. And every stage I've written about so far is like time travel. I go back and relive the events and for days after my former self has inhabited me. I've let her come and stay, showed her that I've made good of my life--married a kind man who protects my vulnerability, have three children I adore so much I could wear them like pendants on my chest all day (one I actually do), enjoy a writing career that holds me stimulation. But when the nineteen year old came knocking, I opened up the door a crack, saw her, and quickly shut it back in her face. Don't you come in. You're too much mess. And plus you disgust me. Then I texted my pro bono (for me) therapist Janna and asked if we could talk about the past and it occurred to me that I maybe need to talk a lot about the past, maybe I need to take some time off to work it out in my heart before I attempt to write about it for posterity. So let's say I've finished PART ONE of my Life Story and in August I'll pick up PART TWO. After all, this is the point of me blogging my life story right? My deadlines are my own. Anyway, for the next few months I'd like to write about my life now, how Ever says things like, "My hair is blowing," when we swing together and how that tiny snippet of stated presence makes my heart so damn hopeful for her. For me too. And I'd like to write about my current life with the same courage I've used to write about my past so far. Which is to say, too much information? Years ago I got a comment from someone who said, "I read your blog because it's like an impending train wreck, I can't look away," which hurt my feelings badly at the time but now I think, that's all of us, we're all headed to and from our train wrecks.